This can be a problem if the opponent likes to volley. Tall opponent's are difficult to get the ball over their head. What gives height to the lob/toss? The height the ball lands on the front wall. Get down under the ball and lift it up high and soft. 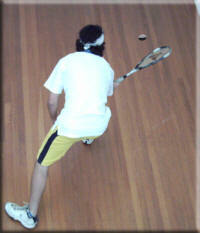 The Squash Library/Lob has photos and diagrams that will help.